You may have noticed a bit of chatter around these parts about miniature war gaming lately. I was infected with the bug first then Ken was worn down and fell to it as well. Being nerds we tend to obsess with things that take our fancy so now we talk about Warhammer 40K a lot between each other. In that vein there are a few RPG's based it this world of Grim Darkness. 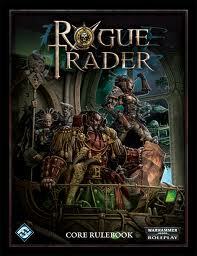 There is Rogue Trader, in which you play someone trying to scratch out a living around constant war and suffering. 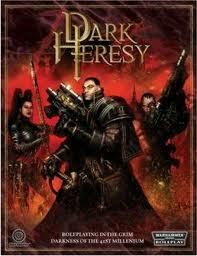 Next up is Dark Heresy. This is where you play a better than normal human that works for the Inquisition routing out Chaos and Xenos that threaten the Imperium of man. 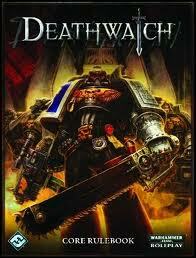 However the one we are going to be focusing on is Deathwatch. This is the game that you take up the mantle of one of the Adeptus Astartes, the Space Marines. I do not personally like the 40K Space Marines much, but I will talk about why another week. The players of the game should know this however because I will be running a Deathwatch adventure in the near future. I will be doing my best to knock those overconfident mutants off of their pedestal - insert evil laugh here. Ken will be playing one of his pyro loving Salamanders, so things WILL burn. Also if there is any interest we may open some slots up for readers to roll up characters as we will be playing over the internets. I am sure this is not the last time you will hear about the universe of 40k upon this esteemed blog, in fact soon I will be showing off my crazy magnetization obsession on some of my army.